Got around £400 to spend and need a new 15.6" laptop? The Lenovo G570 could be the laptop for you - offering you the Intel Core i5 2450M 2.5GHz processor, 6GB of RAM, a huge 750GB hard drive that should have more than enough storage for virtually all users. 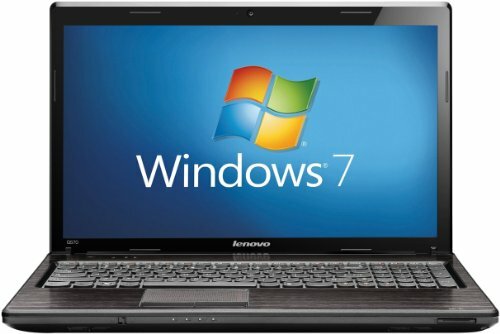 Operating System duties are handled by Windows 7 64-bit, and it also comes with all the usual features, such as webcam and DVDRW drive. Read on for our Lenovo G570 review. Below is our review of the Lenovo G570, a 15.6" laptop, featuring 6GB RAM, 750GB hard drive and Windows 7 Home Premium 64-Bit. The exterior of the G570 features a high gloss shiny finish - it looks smart straight out of the box. Upon opening the notebook, the interior features a similar style design, with the full sized keyboard sat in a slight recess - this looks neat but may attract dust and crumbs - and so may need the odd brush out. Boot up time from cold is very fast, in no small part due to the speedy Intel Core i5 2450M 2.5GHz processor as well as the 6GB of RAM fitted. Similarly the generously sized 750GB hard drive offers an impressive amount of storage, which will comfortably provide ample room for the vast majority of users. Externally this notebook as 3 USB ports, 1 of which is the newer USB 3.0, with the older being USB 2.0. It also offers HDMI output, so you can output the laptop's picture to a larger monitor or TV if required. Ethernet, VGA, headphone and microphone are also catered for, as well as DVDRW and multi card reader. Also included is the standard webcam, which offered a pretty decent picture. The keyboard is easy to type on and during our test our users found it to be both comfortable and with the slight gaps between the keys, easy to avoid typing errors. The touchpad is located slightly to the left hand side of the laptop, lined up with the centre of the keyboard - this is shifted to the left to accommodate a number pad to the right hand side of the notebook. Operating system duties are handled by the robust Windows 7, which functioned well during the test period. As with most laptops, this model came pre-installed with a few programs you may wish to uninstall - however this is fairly standard regardless of which model you choose. Battery life was pretty good during our trial - lasting longer than many of it's rivals. The 15.6" display offers a decent picture, and allow our model was fine, Lenovo users have reported problems with the laptop's hinges in the past - so bear this in mind. So overall what do we think of the 15.6" G570 from Lenovo? Pros: Decent specification, performs very fast, offers very good value for money. Cons: According to other users of this notebook, the hinges can be a weak point. A decent entry level notebook, offering decent performance at a very competitive price. Looks good and works well.